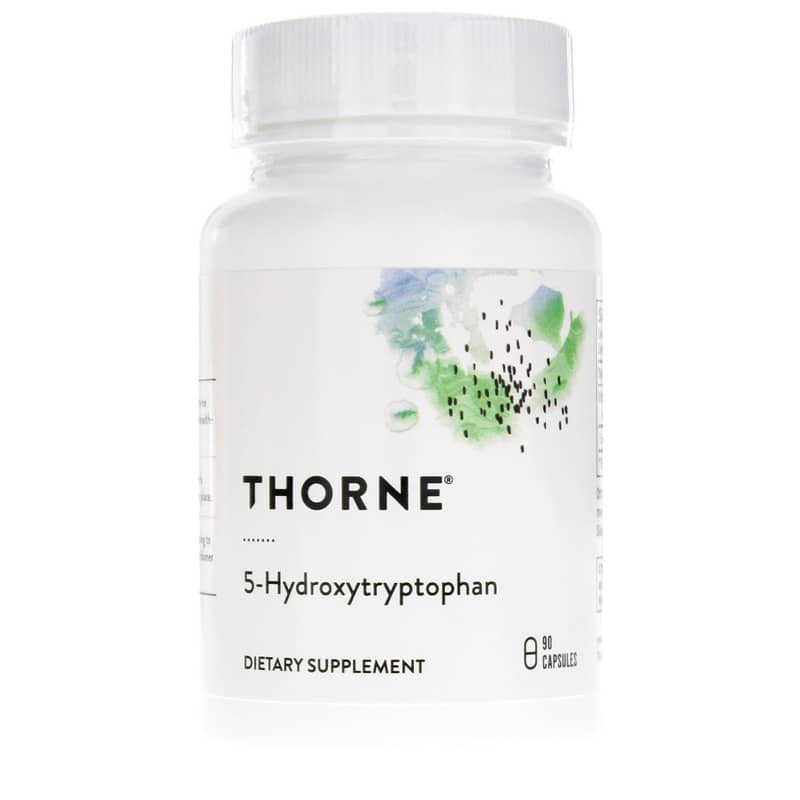 To further facilitate serotonin production, Thorne Research 5-HTP formula contains pyridoxal 5-phosphate, the active form of vitamin B6 and the necessary cofactor for the conversion of 5-HTP to serotonin. * 5-HTP is commercially produced by extraction from the seeds of the African plant, Griffonia simplicifolia. 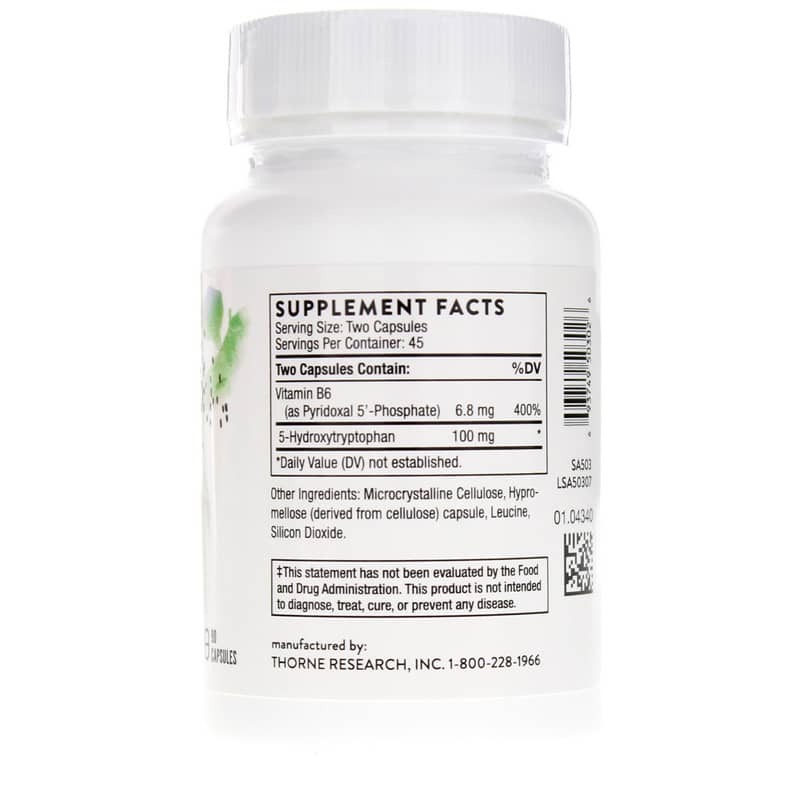 Supplementation with 5-HTP bypasses the conversion of L-tryptophan into 5-HTP by the enzyme tryptophan hydroxylase, the rate-limiting step in the synthesis of serotonin and a step that can be inhibited by a number of factors, including stress, insulin resistance, increasing age, and deficiencies of vitamin C, folate, and iron. Other Ingredients: microcrystalline cellulose, hypromellose (derived from cellulose) capsule, leucine. Adults: Take 1 to 2 capsules 3 times per day or as recommended by a healthcare professional. A woman who is pregnant, or who might become pregnant, should not use 5-hydroxytryptophan. 5-hydroxytryptophan is specifically contraindicated during pregnancy. Should be used with caution with prescription anti-depressants. Keep out of the reach of children. Began taking this about 5 months ago. Excellent alternative! It was recommended. By my Acupuncturist. I have have utilizing it for sleep & have been pleased with its effectiveness . AM definitely flattens my mood, keeping me focused all day. PM allows me to nod off at a regular hour. Very cool stuff. Will always take this and recommend.